The nerve-shredding three-day operation ended on Tuesday when the final members of the “Wild Boars” were freed from the cave which had held them captive since June 23. The rescue sparked jubilation with Thais heaping praise on the rescue team of foreign and local divers as the triumphant tagline “Hooyah” pinballed across social media. “Some of them were asleep, some of them were wiggling their fingers… (as if) groggy, but they were breathing,” Commander Chaiyananta Peeranarong told AFP. “My job was to transfer them along,” he said, adding the “boys were wrapped up in stretchers already when they were being transferred” and were monitored at regular intervals by doctors posted along the kilometres-long escape route. “If you didn’t use the water pump in that location, you could only come out with an oxygen tank,” ex-SEAL Commander Chaiyananta said. It received blanket coverage in Thai media with newspaper The Nation running the headline “Hooyah! Mission accomplished” and the Bangkok Post emblazoned with “All Wild Boars saved”. Despite spending days in the dark, dank, cave health officials said the boys — who are aged 11 to 16 — are in good physical and mental health and eating normal food. 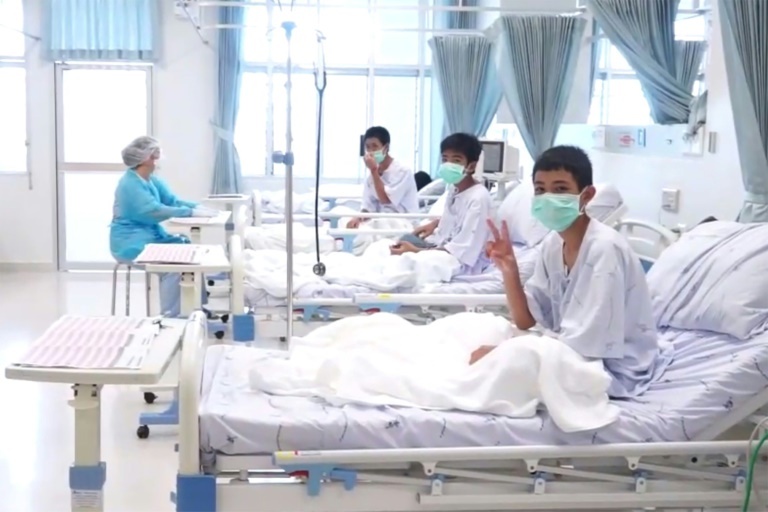 “It might be because they were all together as a team,” public health ministry inspector general Thongchai Lertwilairatanapong told reporters. The saga of the “Wild Boars” gripped the world, with the lives of the group hanging in the balance as the threat of heavy rain injected urgency to an already perilous extraction bid. Duangduen Sittiwongsa, a classmate of 16-year-old Pheeraphat “Night” Sompiengjai, whose birthday fell on the same day the team entered the cave, said they would give him cake when he came back to school. “We will sing a song for him,” she said. The group were taken out in three batches by a team of 13 international divers flanked by the Thai Navy SEALs, who greeted each successful rescue with a “Hooyah” on their Facebook page.